It’s been awhile since I’ve updated, but I’ve kept surprisingly up to date, at least with the designing paperwork part. All of the days have kind of been blurring together a little bit (as normally happens at the end of the semester), but as best as I can remember, Friday I re-touched the chart for Cables & Lace, and wrote the pattern for the Green Tea Scarf. I just needed to redistribute the decreases on the Cables & Lace chart, but it’s looking like this pattern will have to go through multiple versions, and multiple swatches, to get the final stole looking how I want it. The Green Tea Scarf, on the other hand is already on the needles and more than half way done, it’s the beginning of a series of shawls and scarves I’m designed based on various teas. As a matter of fact, the Orange Spicy Scarf that I charted last week is also part of this, though that scarf might be renamed after tangerines because I tend to drink teas with tangerines in them more than teas with orange. I haven’t worked out all the designs in the series or even if I want to give the series a ridged structure, but I’ll hopefully start getting that worked out soon. Saturday was spent charting and writing up the pattern for a scarf currently called Geese & Cables, but will probably be renamed something along the lines of Flying Geese, Birds in the Sky, or something like that. It was originally knit for Lara’s mother as a Christmas present and I don’t have the original. So, pattern stats, photos and the published pattern will have to wait until I can either grab the original for a quick photo shoot, and take measurements, or I re-knit it. The former will probably happen before the latter, but I still want to re-knit it so that I have a one. I spent part of Sunday touching up the written pattern, and then charting and beginning to write the pattern for what is currently being called Tulips. I’m playing around with the idea of creating a collection of designs that I originally knit out of handspun, and therefor are designed around having a finite amount of yarn that the knitter can’t necessarily get more of. Both Tulips and Climbing Trellis would be part of this collection, both having been knit out of handspun originally. Monday I took off, and today was spent finishing up writing Tulips, and re-designing the chart for a pair of snake inspired arm warmers, with optional beads. So that chart, yarn and needles have been added to the “To Swatch” pile. As of this moment I’ve spent just under 15 hours on this project, and I’m really liking the set up I’ve decided on (approximately 1 hour of work a day, with the option for more), and the productivity that I’m seeing. On the other than, I’ve decided to reconfigure the way I’m looking at my second project, the doing one piece of art/craft a day. Before now, I’ve been taking this to mean that I would have one piece of art or craft done everyday. This isn’t working so well. The need to finish a piece of art or craft everyday is pushing me towards the realm of traditional fine arts, but those aren’t the mediums that I choose to express myself with, on a daily basis. While I do occasionally enjoy drawing and painting, in my everyday life I prefer knitting, spinning, sewing or embroidery. So I’ve decided to redefine this project from “create a piece of art everyday,” to “be creative everyday.” While on paper or on a screen this might not look like a huge difference, at least in my mind, this new definition is allowing me to focus my energy on the larger, more complex, and detailed creative projects that I enjoy working on, rather than sketching. On to what I’ve been creating these past few days. 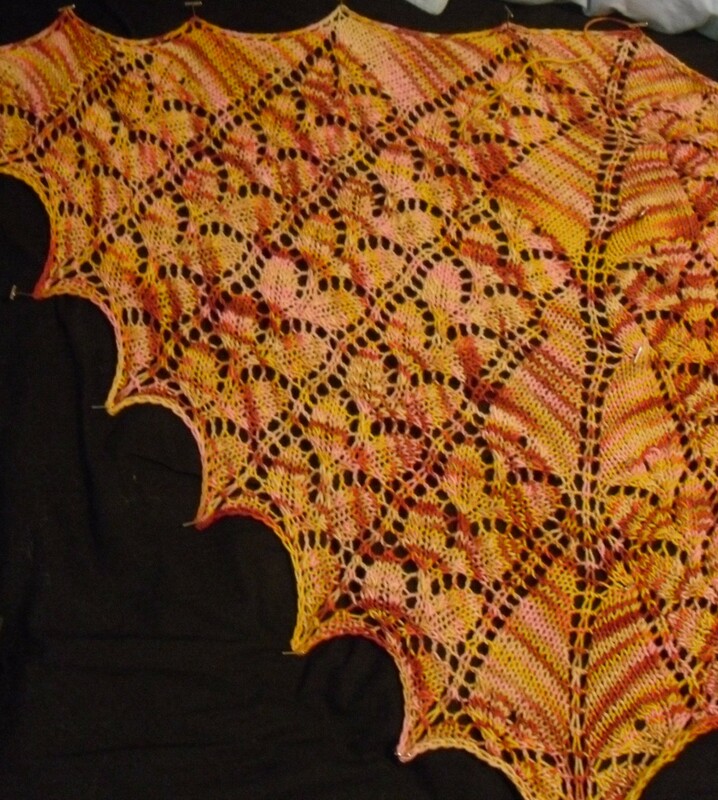 I finished the Birdy shawl/shawlett/scarf/thing. It won’t get properly blocked and finished until I get home and have the space to block lace. But I did roughly pin out half of it for the photo. Sorry for the very bad photo, but that was the best of the lot. I’m still considering this a little bit of a swatch, partly because I finished it in less than a week (I finished it either Friday or Saturday), and partly because I kept tweaking the design without bothering to rip out and re-knit. I’m going to knit this design again, partly to make sure I like whatever new colorway I decide to use, partly to make sure the design elements I changed work throughout the whole shawl, and mostly to double check yardage, I think I currently have less than a yard of yarn left over. I also continued knitting on Que Sera from the latest issue of Knitty I’m working it out of yarn recycled from an old sweater that was around the house, I think the yarn is either 100% or close to 100% cotton, but I’m not positive.I put a handful more repeats onto the Green Tea Scarf, and am close but oh-so-far from being done. The ball is at the point were it is completely collapsed, but there is still a bunch of yarn left. Earlier today I started spinning 4oz of a 70% Merino, 30% Tussah Silk blend that Lara got for me two (?) NY Sheep and Wool Festivals ago. It is from Cloverleaf Farms, in the colorway “Blue” and it is beautiful. The base is a very light blue, with streaks of darker blues, medium blues, silvers, reds, and purples, throughout the roving. When spun up the colors give a depth to the yarn, and the silk give it a shine that makes both the fiber and the spun yarn look almost like a liquid. Here is a link to the picture on the Cloverleaf Farms website, but the colors are much more subtle and blended in real life. I’ll try to get a picture of it tomorrow if the clouds and the rain ever go away for even a handful of minutes. I’ll end it here cause this post is already over 1000 words long.